A truly worldwide event with GB’s John Elliot and Andy Greenhorn keeping their outfit ahead of Aussies Steve Smith and Jim Colligan. 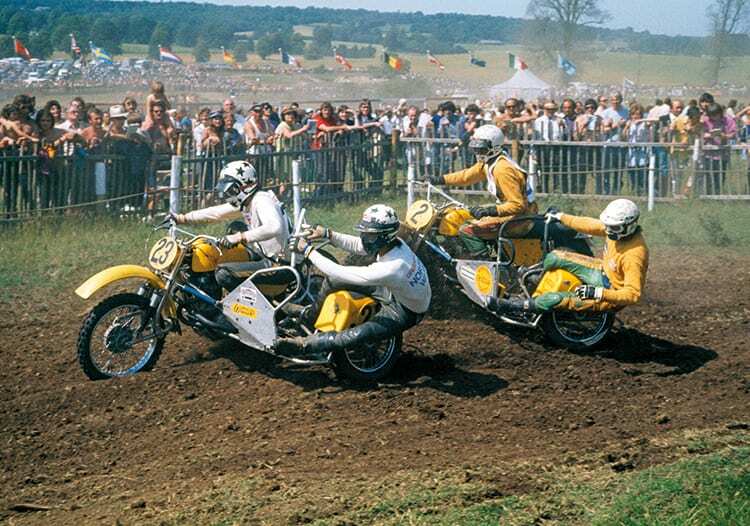 Often viewed as a sideshow to main solo racing, sidecars did eventually gain their own championship with a series of GPs making up a European title contest which did become a world championship in 1980. Though at the time of the feature which attracted my attention here it was still a European contest and one in which the old guard of Robert Grogg and Nick Thompson were lying first and second. So, what got this archive feature to the pages of this publication? The process is hardly scientific as our archive at CDB head office is brimming with glorious images and features from the past. In the case of this particular feature the headline ‘New Boys Shake The Aces’ stood out, and to be fair we all like to see the status quo rocked don’t we? The tale was good and Martin Christie’s report was backed up by some excellent images from the camera of Nick Nicholls who must have had a great day dealing with the dust on July 23, 1974. Reading through Christie’s words it turned out that not one, but three, relative newcomers to the international scene showed their mettle and had the 12,000-strong crowd on their feet that Sunday afternoon… if they could see anything through the clouds of dust.